Almholme Lane in Arksey. (Photo: Google Maps). 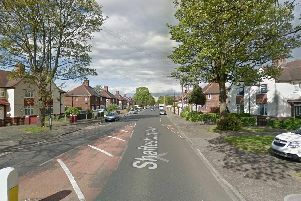 A Doncaster road is still sealed off after a 'serious' road accident involving three cars this morning. Almholme Lane between Arksey and Barnby Dun is still shut following the smash involving a Ford Fiesta, Volkswagen Golf and Dodge Nitro. The male driver of the Fiesta has been taken to Sheffield's Northern General Hospital with serious injuries and is said to be in a stable condition. Two people from the other vehicles are believed to have been taken to DRI although the extent of their injuries is not known at this time. Police, ambulance and fire crews have spent the morning at the scene of the accident and the road is shut in both directions following the incident at 7.50am. One eyewitness said: "It looked pretty bad. I couldn't see much but they looked to be using cutting gear on the car. "Drivers were being turned back and the road was closed in both directions. It looked serious." The accident is understood to have happened just after the caravan park Wittsend Park caravan site in Arksey on the road which links the village with Barnby Dun. A separate three car collision is understood to have taken place at Top Road in Barnby Dun, also at rush hour this morning, while a motorcyclist was airlifted to Northern General Hospital following an incident on Balby Carr Bank this morning.